TEHRAN (Tasnim) - Iran's deputy ambassador to the United Nation underlined the need for the expulsion of terrorists from Syria, stressing that the Arab country's fate must be decided in a Syrian-led and Syrian-owned political process. 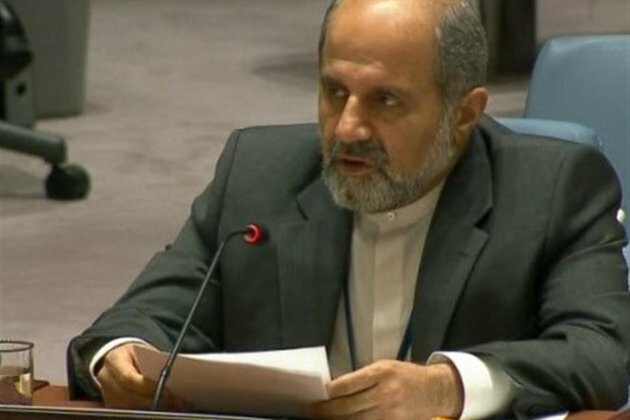 The Iranian diplomat also argued that "foreign terrorist fighters should return to their country of origin and terrorists with Syrian origin must be dealt with according to Syrian law." The proposal that was submitted in this regard needs to be further examined and adjusted. In their upcoming consultations in Geneva, the representatives of the Astana Guarantor States will discuss this issue with the SG's Special Envoy. Equally important is Syria's reconstruction. This is critical in facilitating the return of refugees and IDPs as well as launching a significant political process. While the Syrian Government has already started the reconstruction process, the international community needs to contribute to this country in order to rebuild all of its infrastructures. This should not be politicized, delayed or made conditional.